Once upon a time Bear was a lonely, tired stray. He had been found laying in a ditch by a passing driver who took him to the Humane Society for care. Bear was dirty, and weak, and did not want to move. He had a list of health issues – common for a dog his age, but still extreme. 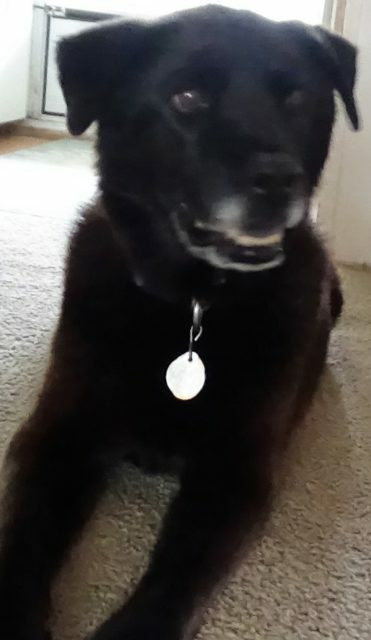 His teeth were bad and he had arthritis, impaired eyesight, and a serious case of heartworms. The Humane Society was able to bring his health up enough to make him comfortable and get him eating and drinking, but without the love of a family, he would not last long. In his dire condition, Bear was not safe in a shelter. Pleas and alerts went out from well-meaning people on social media, and one reached Jackie Baker from a local Facebook lost & found page. When the two met, she knew she couldn’t leave him behind. Deena and her mother adopted him the day he was scheduled to be euthanized. They knew his health would improve, but there were concerns about how he’d fare in a house filled with cats. 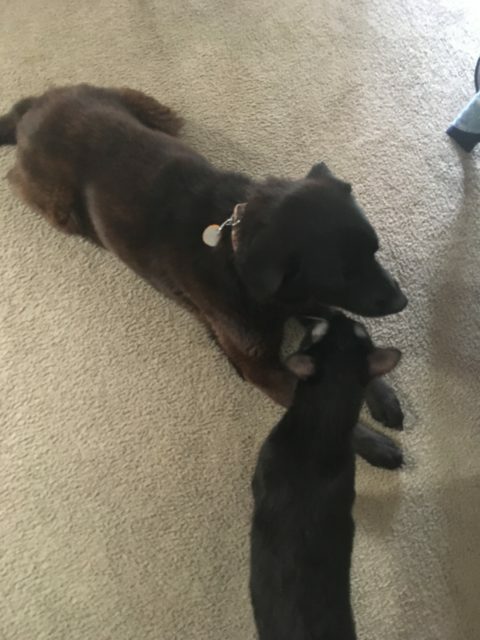 However, Bear fit right in to his new family like he had always belonged there. “We knew everything was fixable in time. The only reservation we had was how would he get along with the kitties. 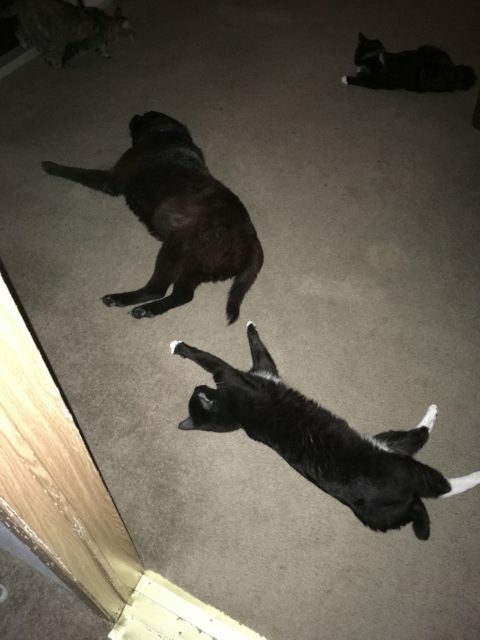 When he came home he laid on the floor and the kitties surrounded him like they knew he didn’t feel well. As he went through his treatments he slowly became stronger and stronger until now he literally chases the kitties through the house. Bear has been a big comfort to both women. He brings joy to Jackie, who is living without the company of her husband, and to Deena, an Iraq veteran. The two brought home an old dog with health issues, but were surprised to find out how much of a puppy he still was on the inside! 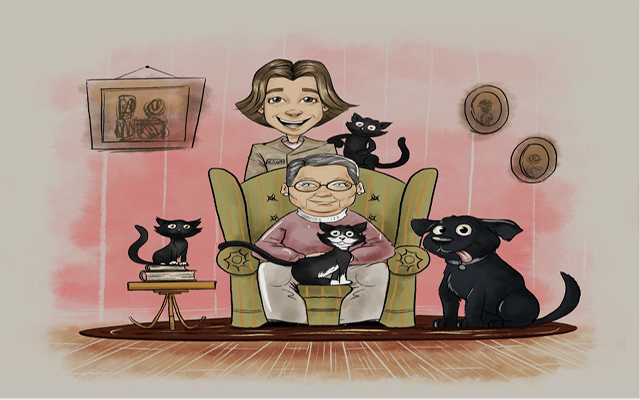 Bear’s story was retold over and over to friends and neighbors, until Deena became inspired to put it all into a children’s book. Though Deena already knew that dog rescue was important, she wanted to spread the word to future generations. Her book took a few weeks to complete, but it is now available on Amazon, and tells Bear’s touching story with cute, brightly colored pictures. Not only does Bear’s book help children learn about how dog rescue changes the lives of both pets and the people lucky enough to have them, but it also helps Deena and her mother pay for Bear’s medical care. He has improved drastically since his adoption, but his family hopes to keep him comfortable and happy for the rest of his life – just as he has made them happy since he has joined them. Hopefully, Deena’s book will encourage others to give a chance to a dog who is just waiting to blossom, like Bear. 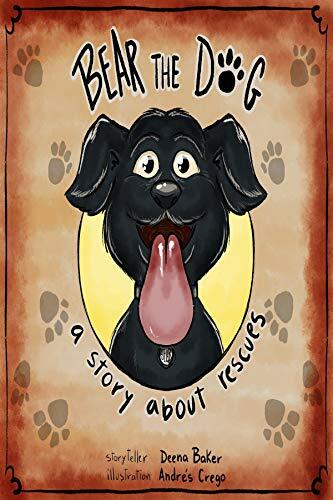 Bear The Dog: A Story About Rescues by Deena Baker is available for your Kindle device on Amazon for only $2.99!